Adly brings to the table a focus in Banking Litigation, Civil Litigation, Intellectual Property Law, Family Law and Criminal Law. He also won The Singapore Institute of Legal Education Prize for the Best Candidate in Intellectual Property Law Practice in Part B of the Singapore Bar Examinations in 2017. 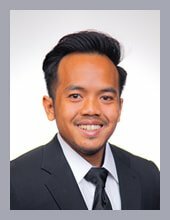 Having graduated from the University of Bristol in June 2014, Adly was subsequently admitted to the Singapore Bar in May 2018. Prior to joining Tito Isaac & Co LLP, Adly started off as a Trademarks Executive at a boutique IP firm in September 2014 until March 2015. Subsequently, he commenced his relevant legal training and practice training at the same firm from April 2015 till December 2015 and from December 2016 until June 2017 respectively. He chose to pursue a legal career because it is one that is intellectually stimulating, keeping him on his toes, and constantly challenging him to think outside of the box at the same time. Adly has said that his experience in the legal industry thus far has taught him the importance of staying humble and grounded. It has also instilled in him the belief that even a little bit of help can go a long way. Outside of work, Adly enjoys playing rugby and is a member of Oldham Rugby Singapore.